Ladies and gentlemen, feast your eyes on this! This particular cake, I’d been dreaming about for months and just couldn’t wait for my birthday to finally get here so I can make it already. And then eat it, of course… I would drool uncontrollably at the mere thought! 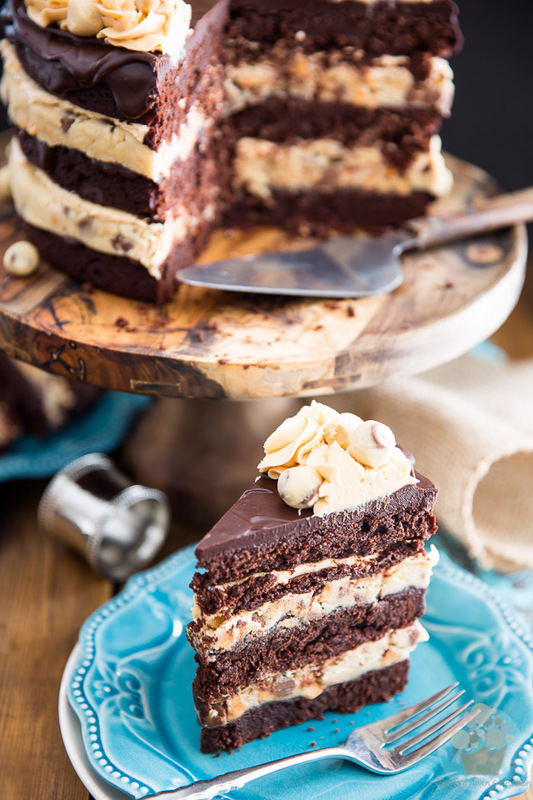 But hey, you’re looking at 3 delicious layers of Fudgy Brownies, 2 equally delicious layers of soft Butterscotch Cookie Dough, all topped with a smooth and silky Dark Chocolate Ganache and a fluffy Butterscotch Frosting — this, my friends, is pure bliss and decadence in every single bite! Honestly, I wouldn’t hesitate to whip one up again, not even for one second. With that in mind, I’ll keep the talking to a minimum and let you get started. 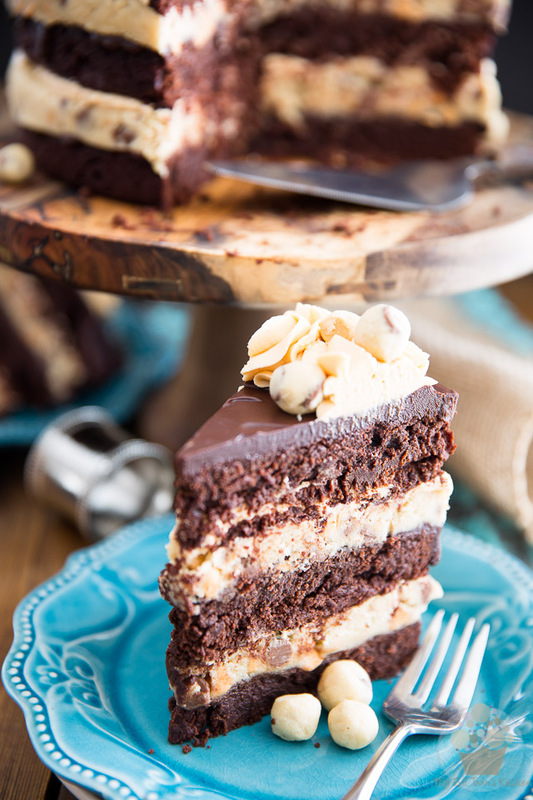 Just look at the pictures and take my word for it: This cake is good. Real good. Make it. Now. Preheat your oven to 350°F. 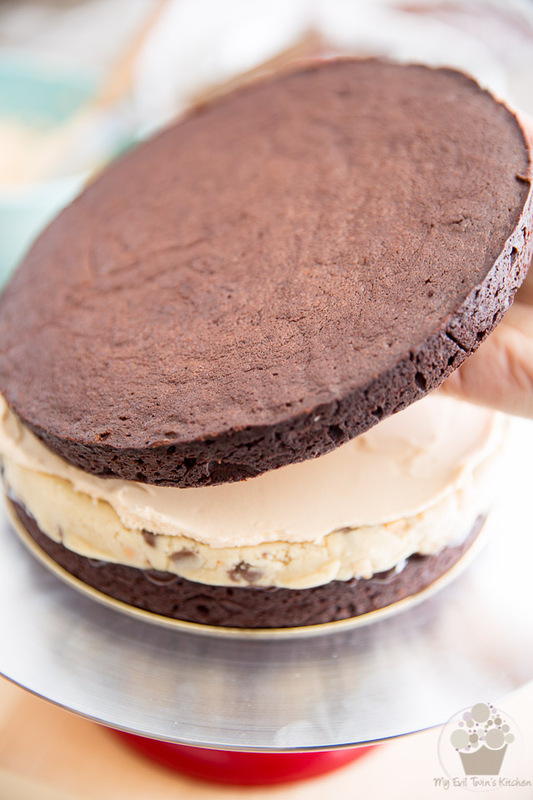 Grease 3- 8″ round cake pans and line the bottom with parchment paper. Melt the butter and chocolate together in the microwave in 30 seconds increments, stirring well between each increment. Make sure that you don’t let the mixture get too hot, as it would cook the eggs if it did. Just let it get hot enough so all the chocolate gets completely melted. In a separate bowl, combine the sugar and eggs and mix until just until combined, no more. You do not want to overmix this mixture, as you do not want to incorporate air into those eggs. Delicately pour in the melted chocolate mixture. Dilute the coffee granules in the hot water, stir in vanilla and salt and mix this into the egg/chocolate mixture. …and spread to an even thickness. Bake for 25 minutes, or until the edges are firm to the touch but the center is still somewhat soft. Do not overbake — this would make your brownies dry and crumbly. Take the brownies out of the oven and place them on a wire rack to cool for 10 minutes then delicately unmold and place on rack to cool completely. 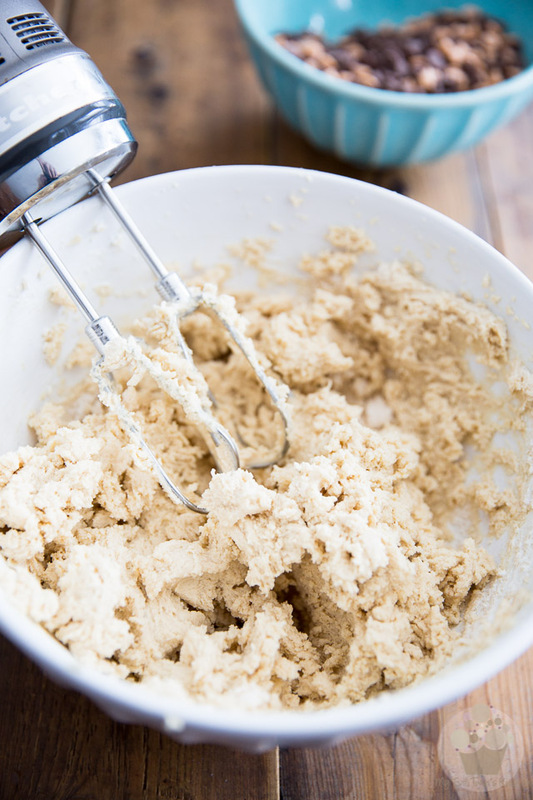 In a large bowl, combine the flour and salt; whisk thoroughly until fluffy and perfectly combined and set aside. 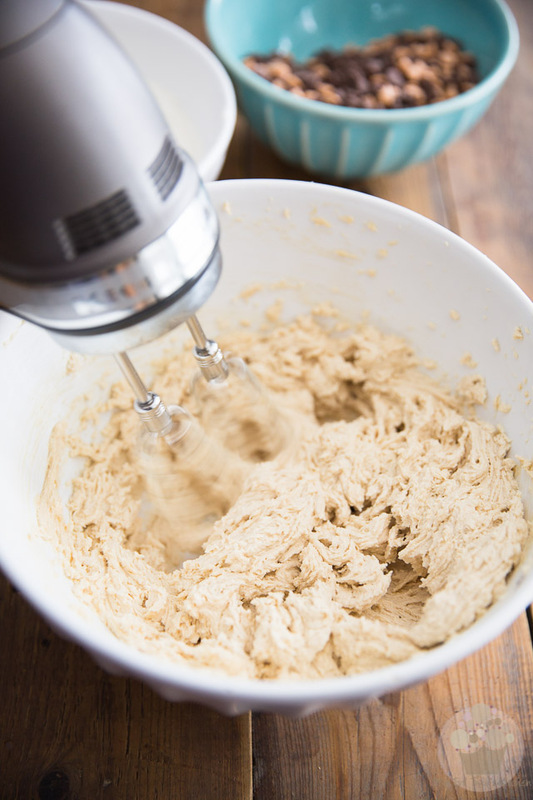 In a separate bowl, cream the butter and sugars with the heavy cream, vanilla and caramel extract: beat with a hand mixer for 2-3 minutes on high speed until light and fluffy. …and mix on low speed until just combined. With a rubber spatula, delicately fold in the chocolate and butterscotch chips. 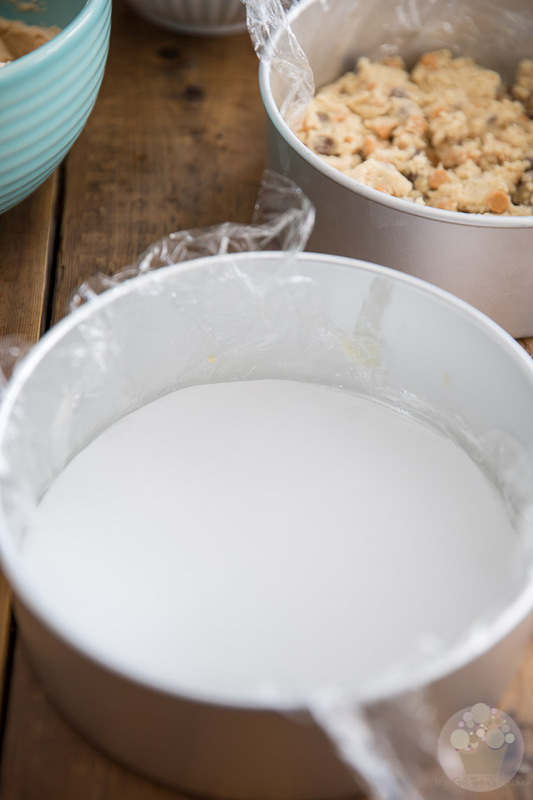 Line 2- 8″ round cake pans with plastic film; you you can help hold it the plastic film down by applying a few little dabs of butter here and there on the pan. Then, place a circle of parchment paper over the plastic film. 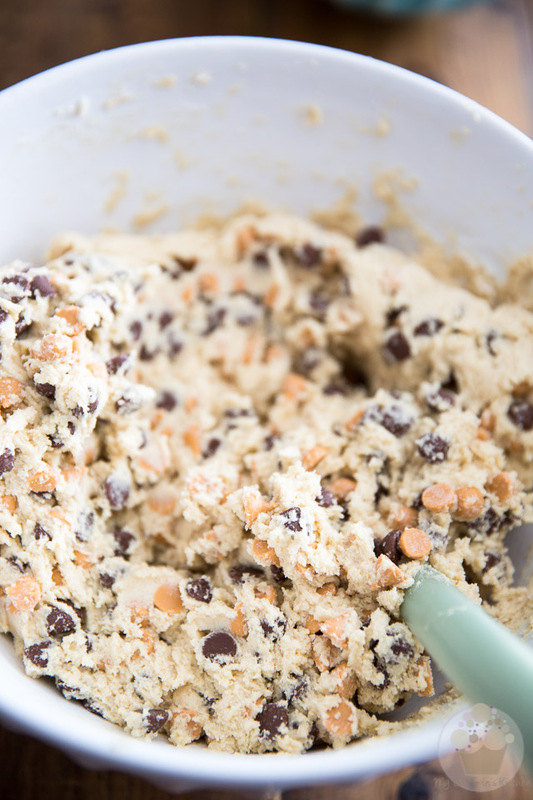 This will ensure that your cookie dough comes out of the pan all beautiful and nice and flat and in one piece! Each bead should contain no more than one or two chocolate chip. Divide the rest of the batter between the 2 prepared pans — you should be getting around 625g per pan this time. 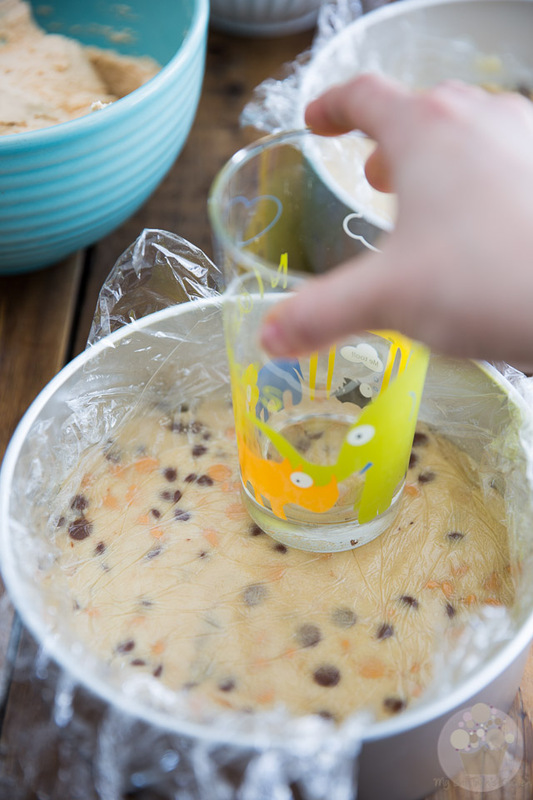 Then cover the dough with a piece of plastic film and flatten it with the help of a flat bottomed object such as a drinking glass. Place in the refrigerator to set. 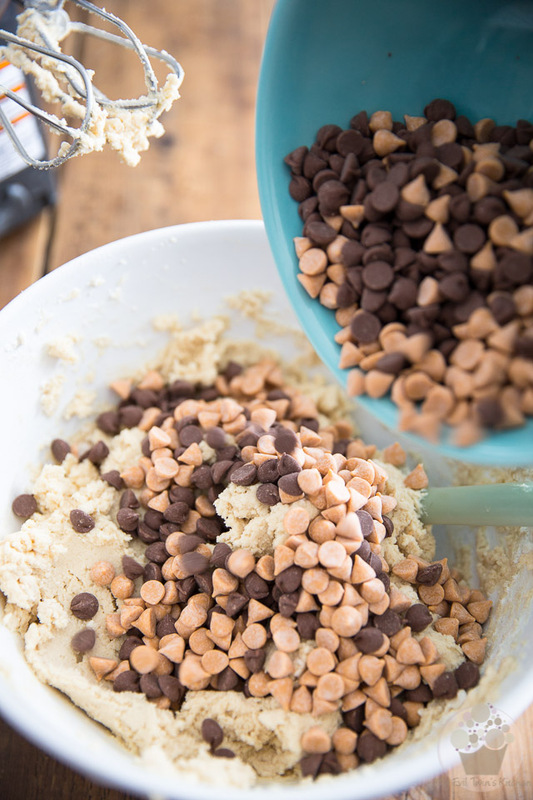 In a large mixing bowl, combine the butter and melted butterscotch chips. Make sure that the melted butterscotch chips aren’t hot, otherwise they’ll end up completely melt the butter. If you feel that the concoction feels too hot to the touch after you’ve melted the chips, let it rest until it feels just barely warmer than body temperature. 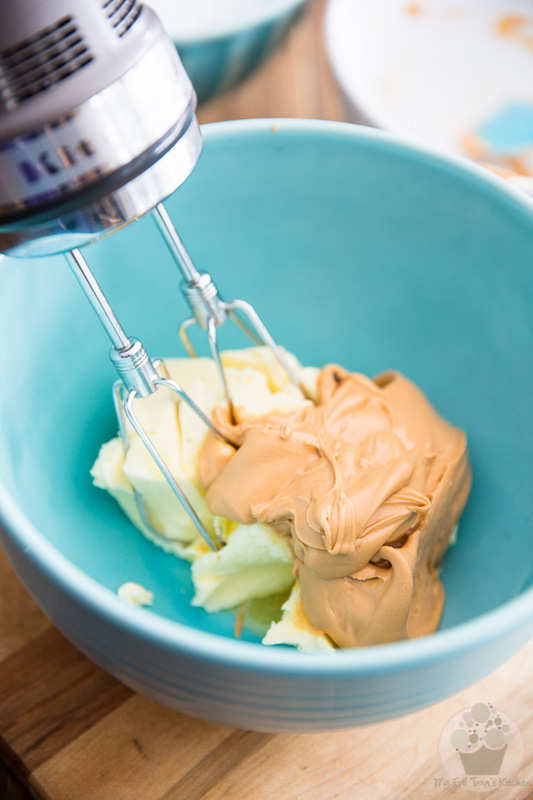 Beat the butter and melted butterscotch chips with an electric mixer on high speed until the mixture has a consistency similar to that of creamy pudding, about 2 minutes. …and beat on low speed until light and fluffy, about 5 minutes. 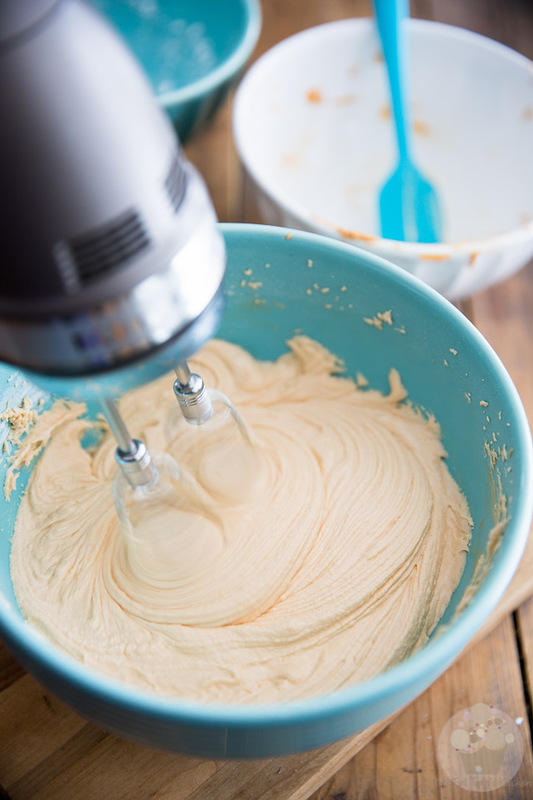 If you find that your frosting is a bit too soft to your liking, put it in the fridge to firm up for a few minutes then give it another quick beating. 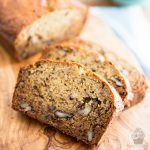 Set the finished frosting aside, at room temperature until ready to use. 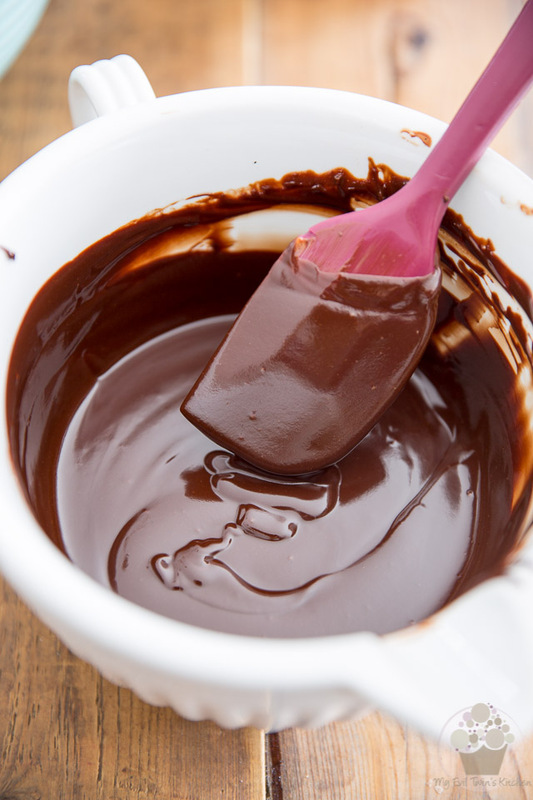 In a mixing bowl, combine the chopped chocolate, heavy cream and butter and place that in the microwave for 1 minute. Allow to rest for 1 full minute and then stir for 1 minute. 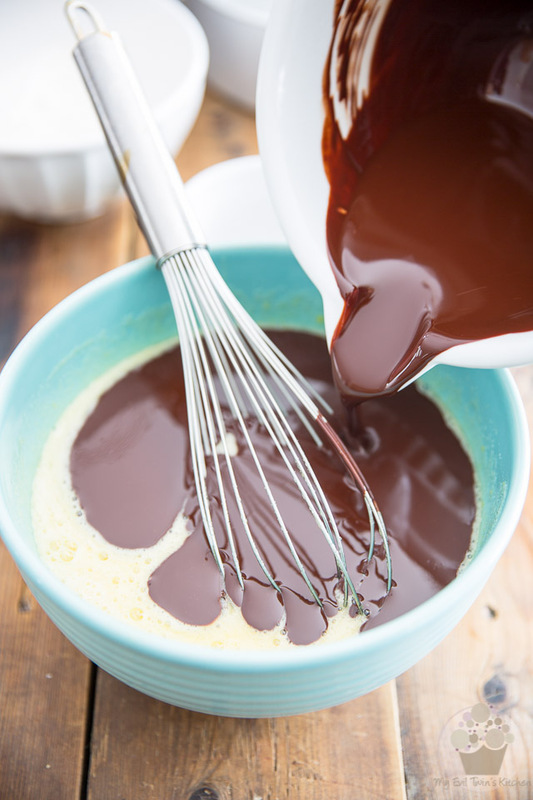 If there were still lumps of unmelted chocolate left after that, repeat the process but for 30 seconds this time, and continue doing that until the chocolate is completely melted and the ganache is fully combined and silky, without feeling hot to the touch. Now we’re ready to assemble our cake. Finally! 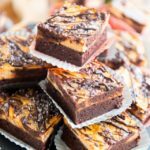 Once the brownies are completely cooled, place one of the cakes on a plate or cake board and pour about 1/2 cup of the ganache on its top. 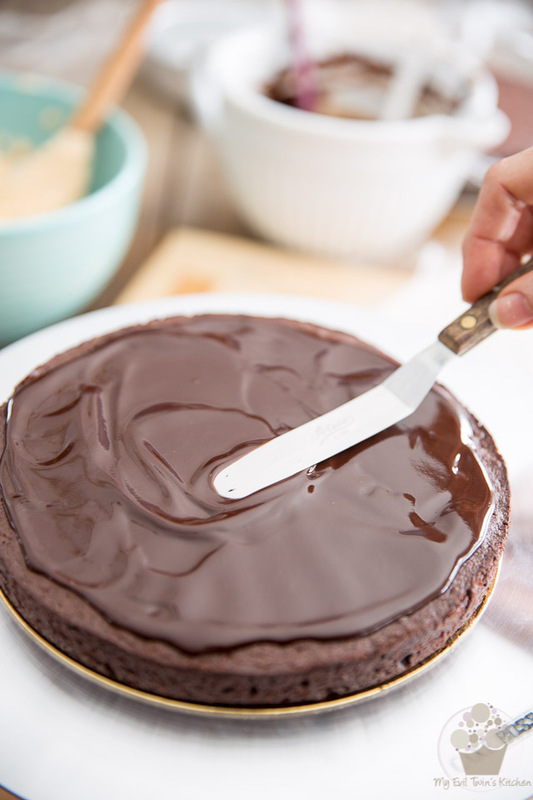 Delicately spread the ganache almost all the way to the edge, leaving about 1/2″ all around. 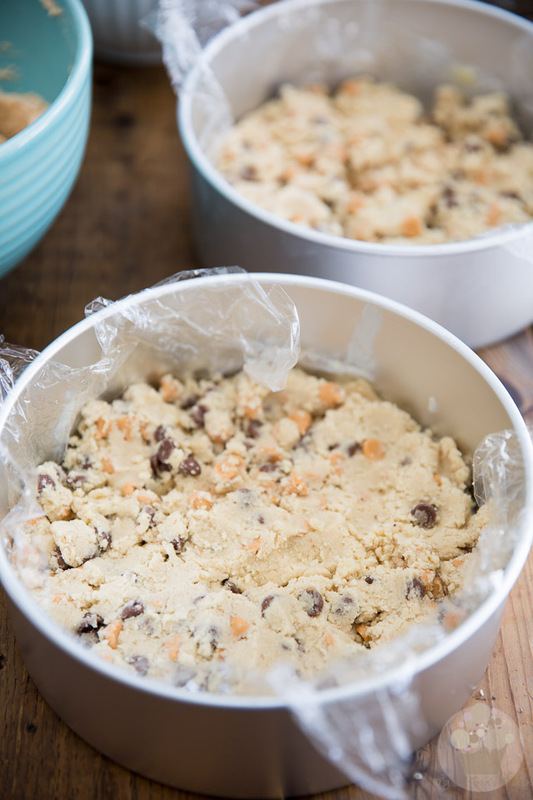 Delicately take one of the cookie dough discs out of the pan by pulling on the plastic film. 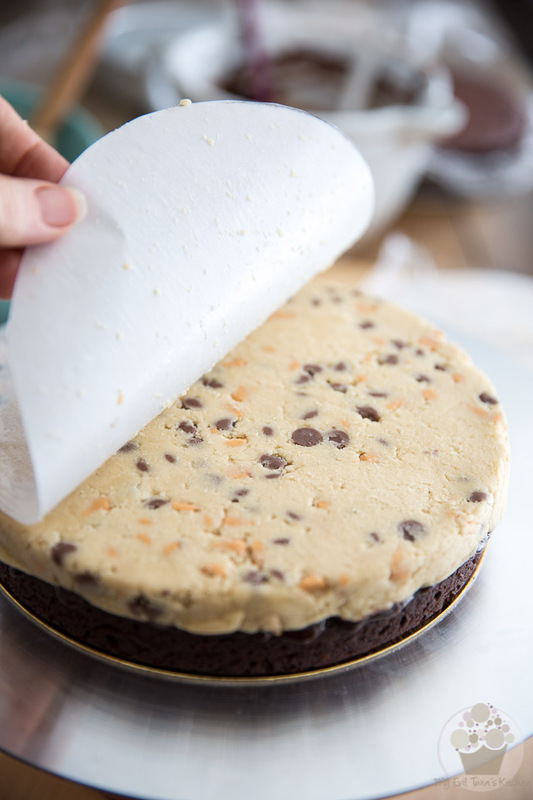 Remove said plastic film but leave the parchment paper in place and delicately position that disc of cookie dough over the ganache covered brownie. 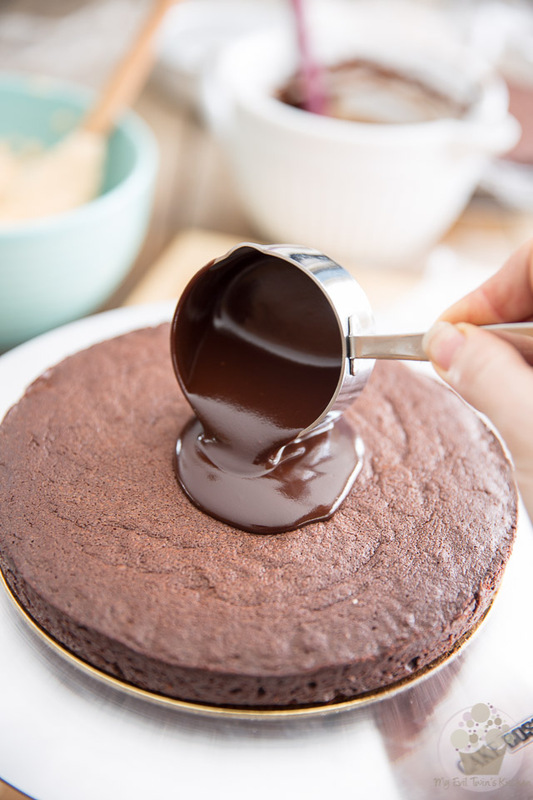 Apply gentle pressure to make just a little bit of the ganache ooze out and ensure that the layers adhere well to one another and then remove the parchment paper. Cover the cookie dough with a fairly thin layer of the butterscotch frosting; again, do not go quite all the way to the edge. 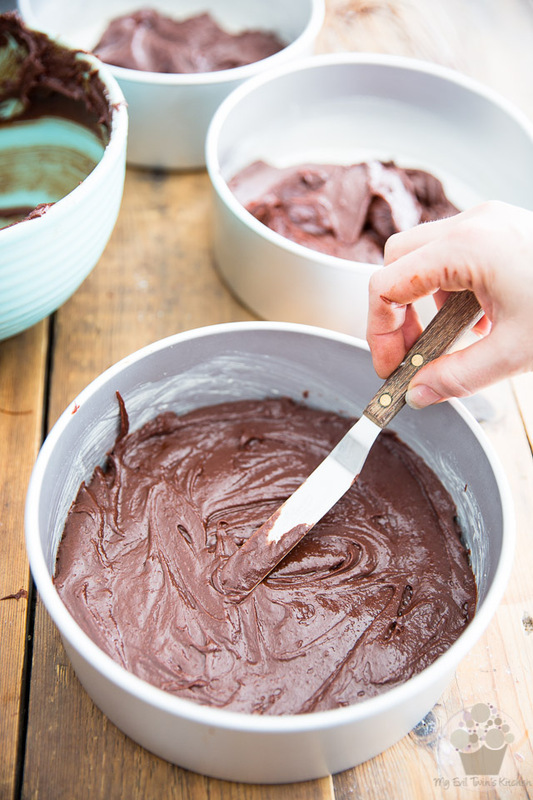 Cover with a second layer of brownie and again, apply gentle pressure to make sure that the layers adhere well. Repeat the previous steps -i.e. 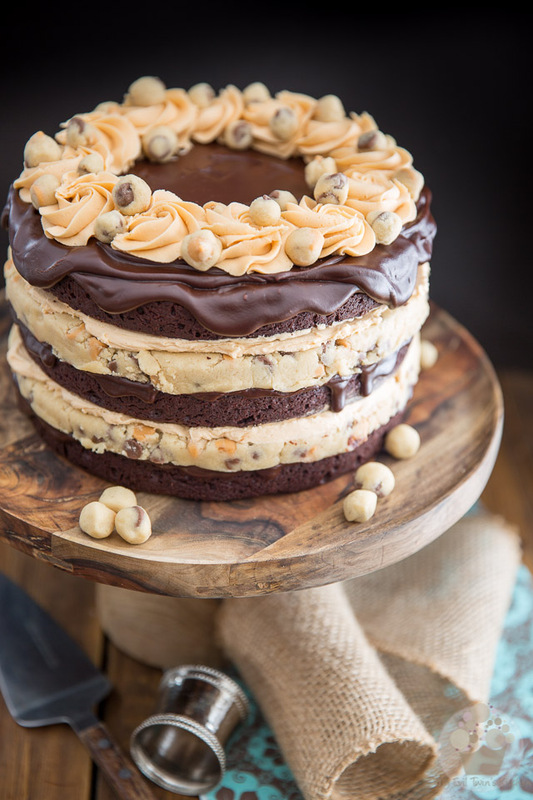 spread 1/2 cup ganache over the brownie, cover with cookie dough, apply gentle pressure, spread butterscotch frosting over cookie dough and top with final brownie, then apply gentle pressure once more. Pour about half of the remaining ganache over the top brownie and spread it all the way to the edge this time, pushing it slightly past the edge to create little drizzles down the sides of the cake. 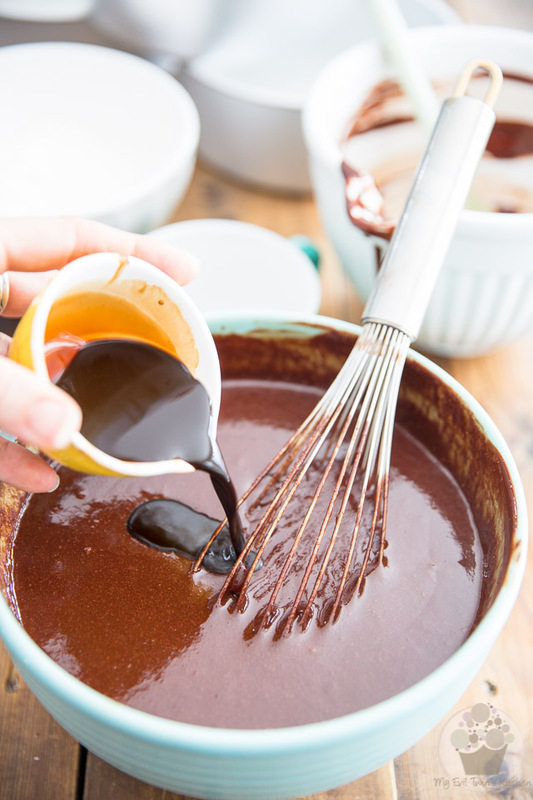 Repeat the process with the last of the ganache. 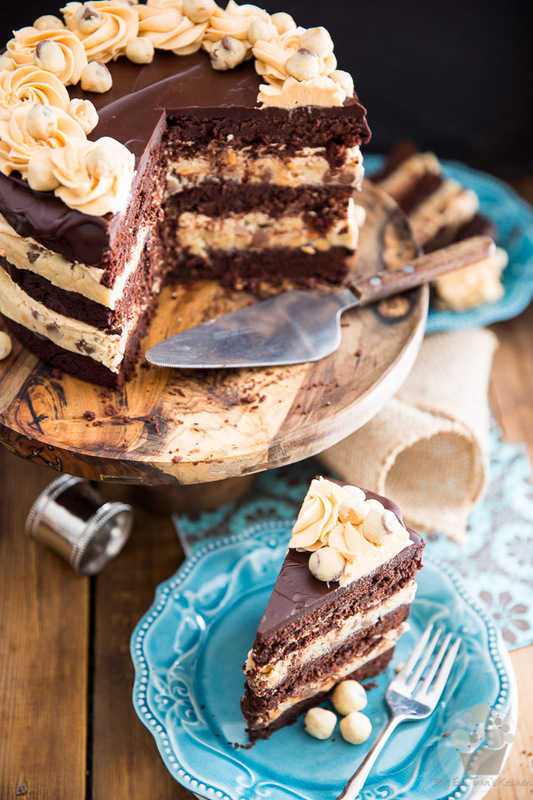 Place the cake in the refrigerator to set for about 15 minutes. Fill a pastry bag bag equipped with a 2D Drop Flower Decorating Tip with butterscotch frosting and pipe 12 generous swirls around the top of the cake. 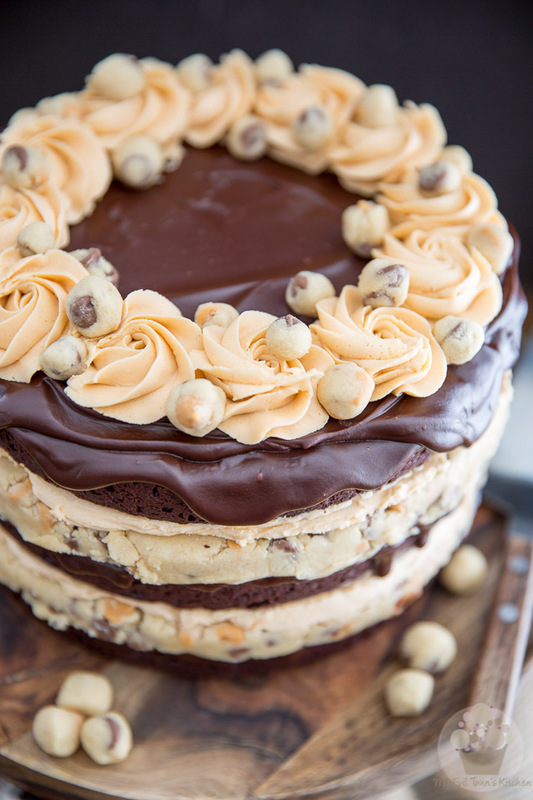 Decorate with the little beads of cookie dough you made earlier. Serve chilled or at room temperature. Leftovers can be kept at room temperature for up to a few days, or in the refrigerator for up to a week. Melt the butter and chocolate together in the microwave in 30 seconds increments, stirring well between each increment. 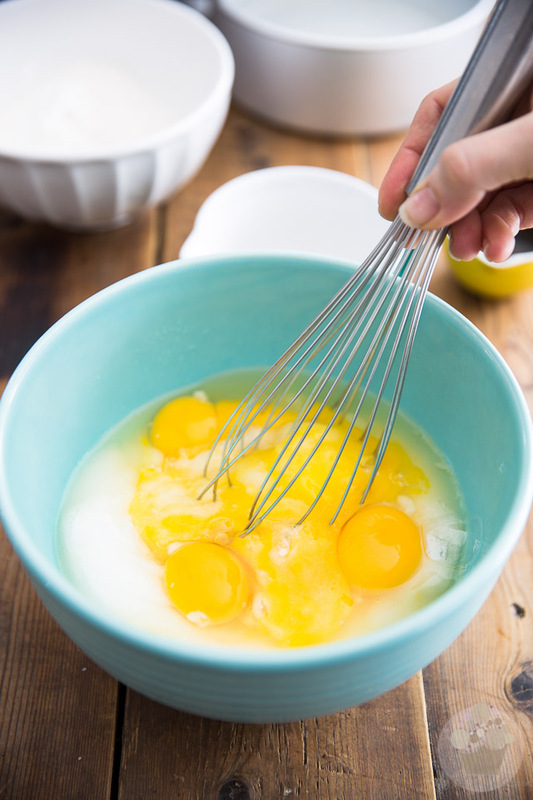 Make sure that you don't let the mixture get too hot, as it would cook the eggs if it did. Just let it get hot enough so all the chocolate gets completely melted. 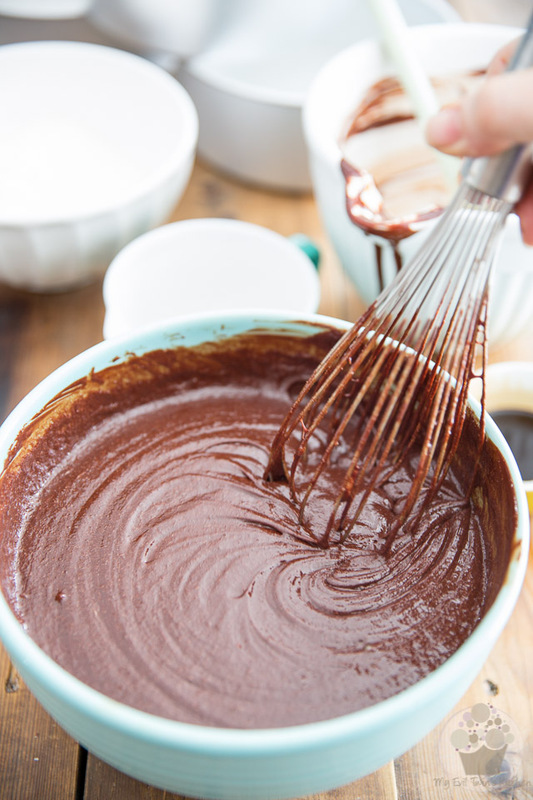 Delicately whisk in the melted chocolate mixture. Dilute the coffee granules in the hot water, stir in vanilla and salt and mix this into the egg/chocolate mixture. 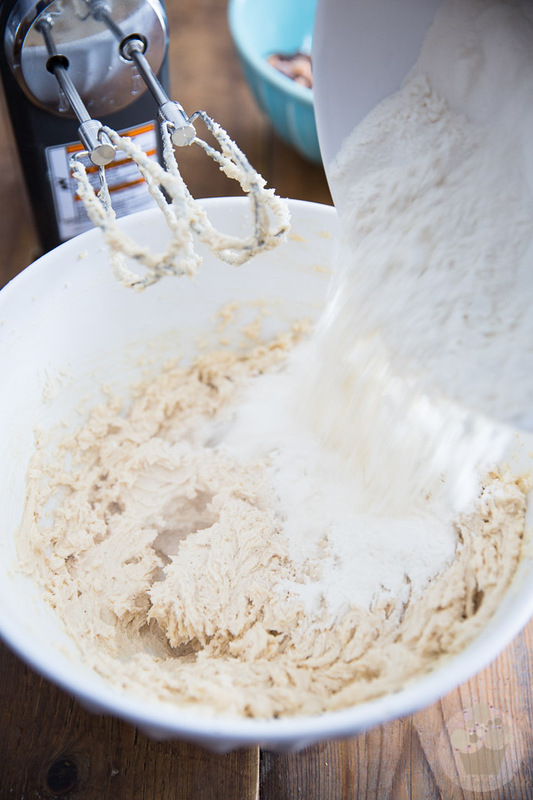 Add the flour all at once and stir with a rubber spatula until just combined. Divide the batter between the 3 prepared pans (you should be getting around 630g per pan) and spread to an even thickness. Bake for 25 minutes, or until the edges are firm to the touch but the center is still somewhat soft. Do not overbake! Take the brownies out of the oven and place them on a wire rack to cool for 10 minutes then delicately unmold and place on rack to cool completely. 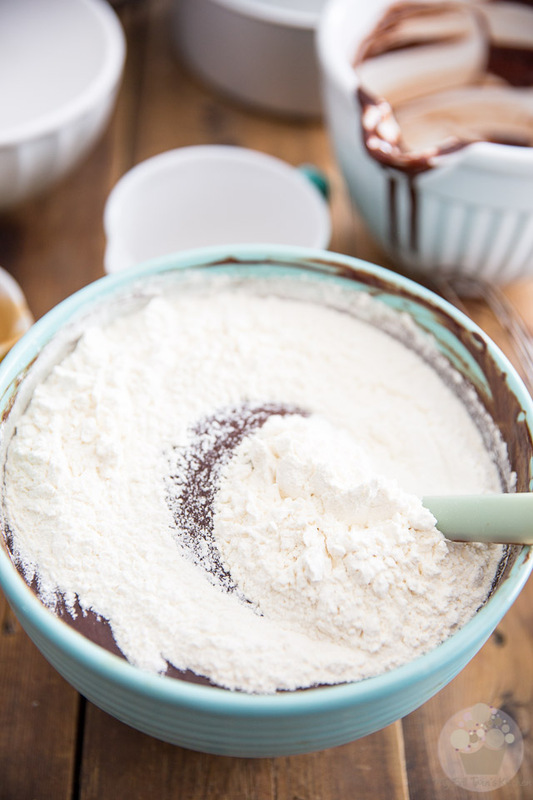 Delicately pour in the flour, all at once, and mix on low speed until just combined. 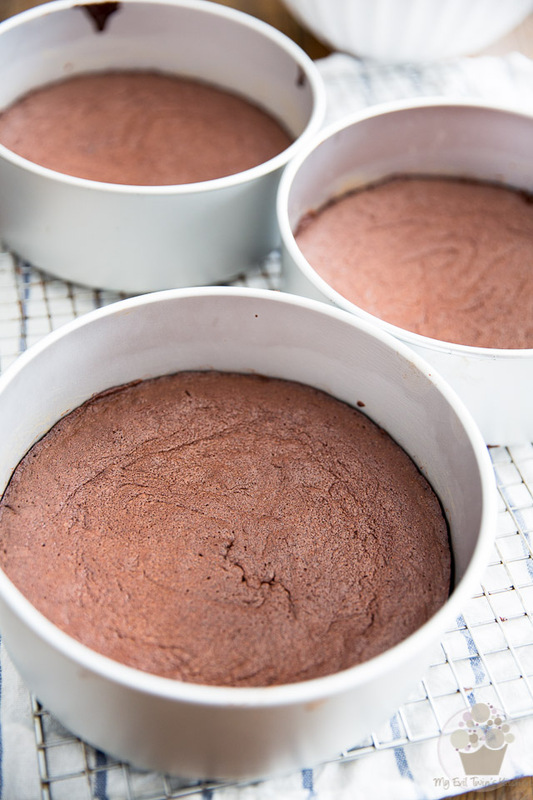 Line 2- 8" round cake pans with plastic film (you can help hold it down with a few little dabs of butter here and there) and then line with a parchment paper circle placed over the plastic film. Roll about 3 dozen mini balls of cookie dough (about the size of a chickpea) and divide the rest of the batter between the 2 prepared pans (you should be getting around 625g per pan this time). 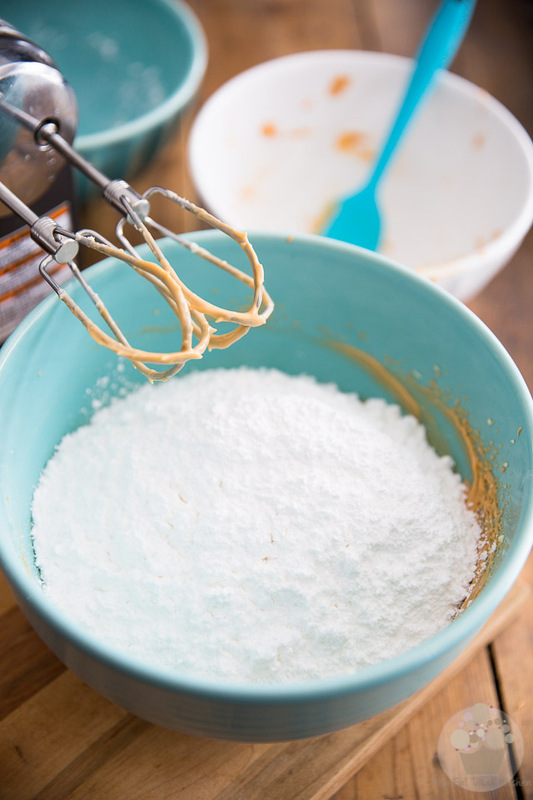 Delicately spread the batter all the way to the edge with the help of a rubber spatula, then cover the dough with a piece of plastic film and flatten it with the help of a flat bottomed object such as a drinking glass. Place in the refrigerator to set. 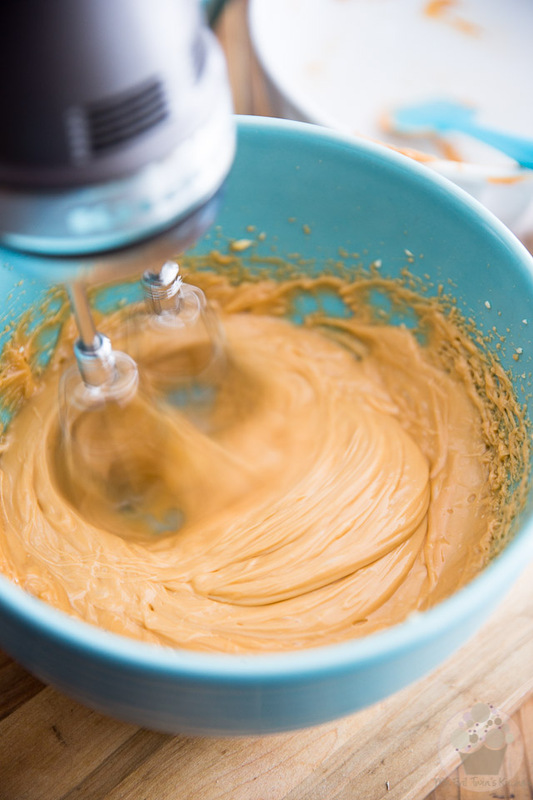 In a large mixing bowl, beat the butter and melted butterscotch chips with an electric mixer on high speed until the mixture has a consistency similar to soft pudding, about 2 minutes. Add the powdered sugar and salt and beat on low speed until light and fluffy, about 3 more minutes. Set aside, at room temperature until ready to use. 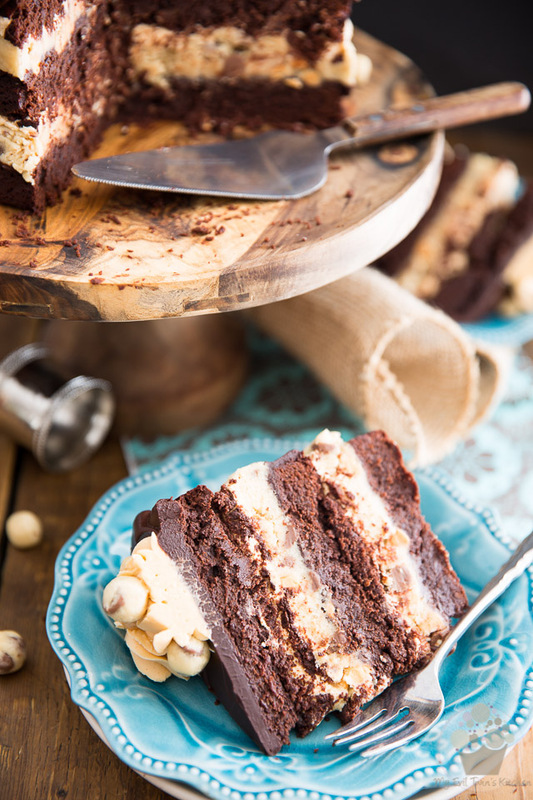 If the frosting was too soft to your liking, put it in the fridge to firm up for a few minutes then beat again for a few seconds. 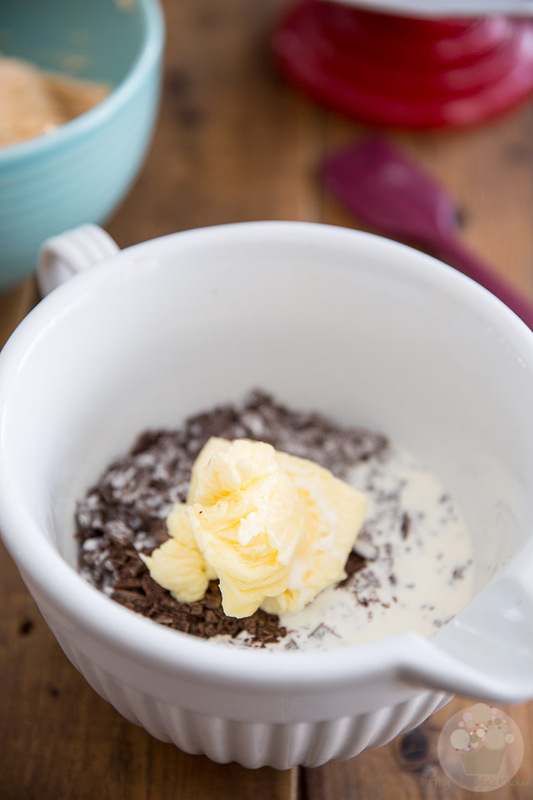 In a mixing bowl, combine the chopped chocolate, heavy cream and butter and place that in the microwave for 1 minute. Allow to rest for 1 full minute and then stir for 1 minute. 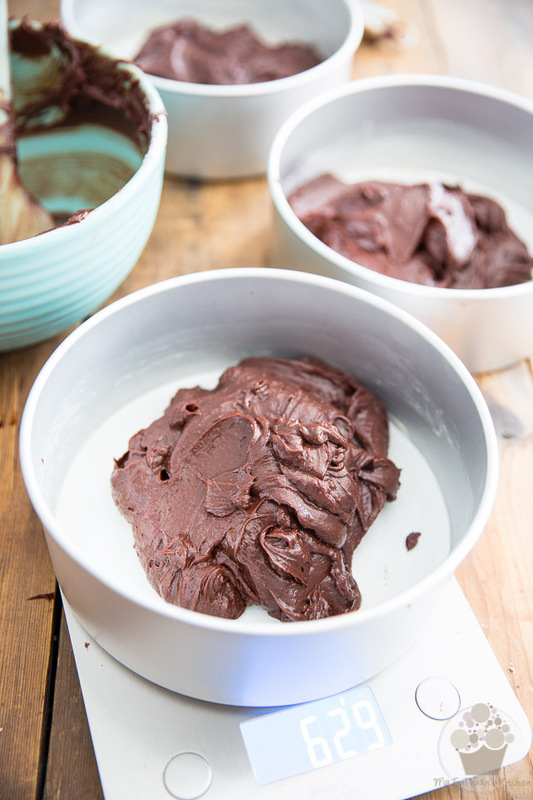 If there were still lumps of unmelted chocolate left after that, repeat the process but for 30 seconds this time, and continue doing that until the chocolate is completely melted and the ganache is fully combined without feeling hot to the touch. 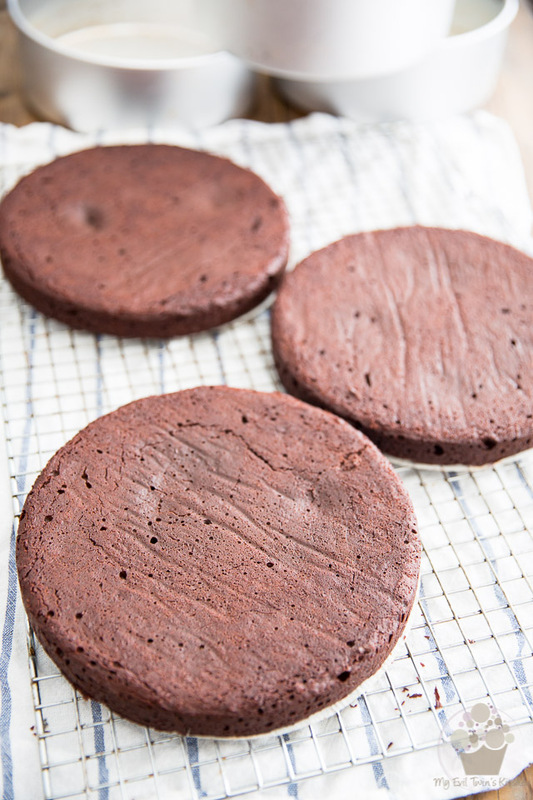 Once completely cooled, place a brownie cake on a plate or cake board and pour about 1/2 cup of the ganache on its top. Delicately spread the ganache almost all the way to the edge, leaving about 1/2" all around. 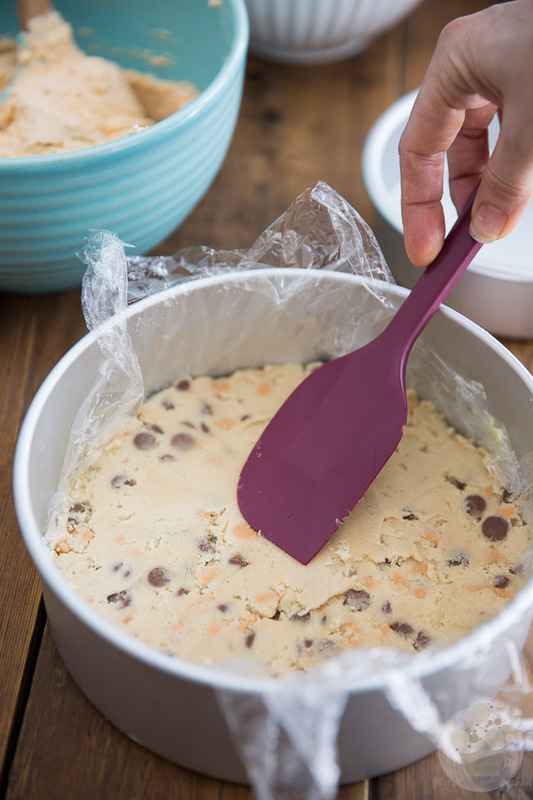 Delicately take one of the cookie dough discs out of the pan by pulling on the plastic film. 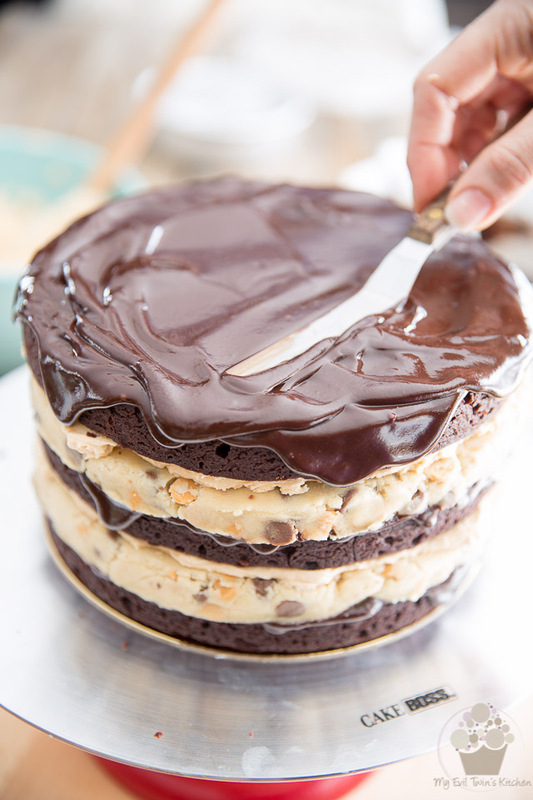 Remove said plastic film but leave the parchment paper in place and delicately position that disc of cookie dough over the ganache covered brownie. 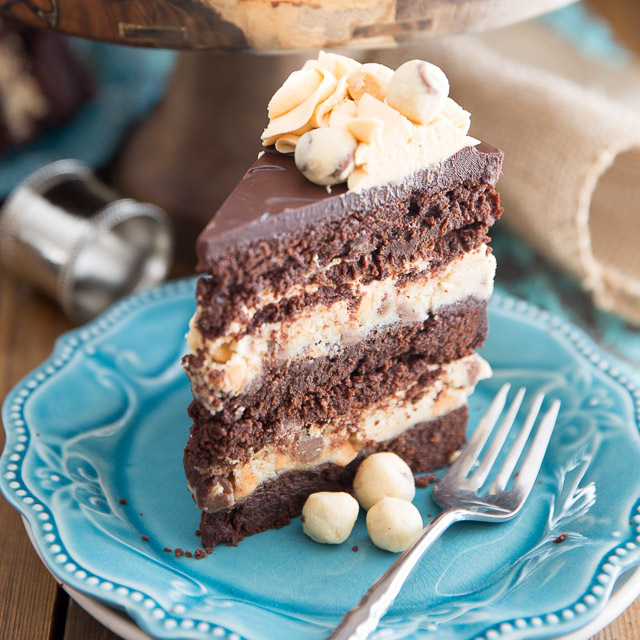 Apply gentle pressure to make just a little bit of the ganache ooze out and ensure that the layers adhere well to one another. 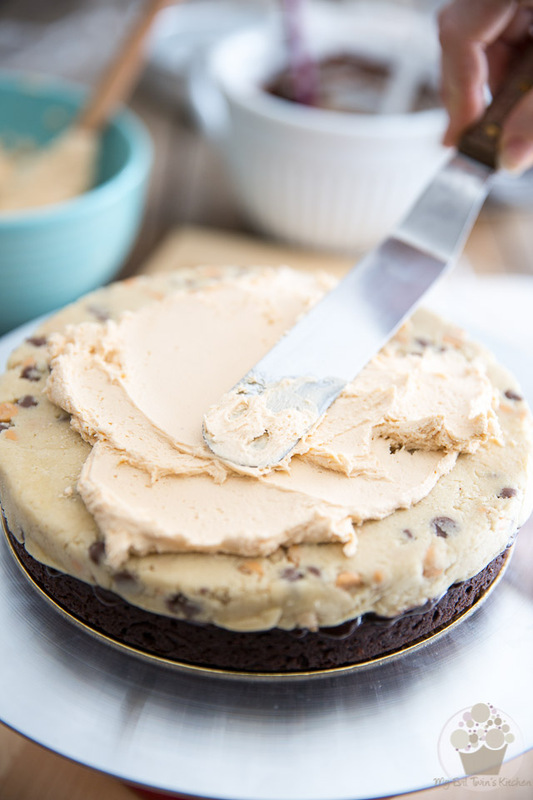 Remove the parchment paper and cover the cookie dough with a fairly thin layer of the butterscotch frosting; again, do not go quite all the way to the edge. 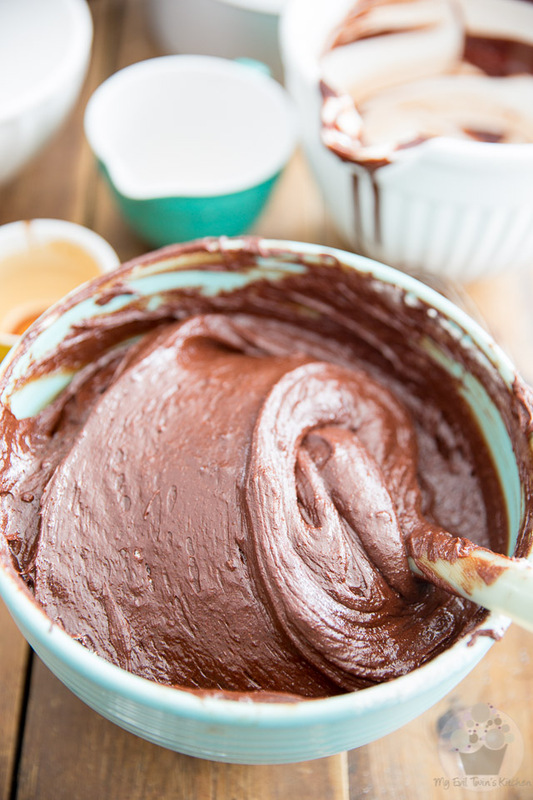 Cover with a second layer of brownie and again, apply gentle pressure to make sure that the layers adhere well. Repeat the previous steps -i.e. 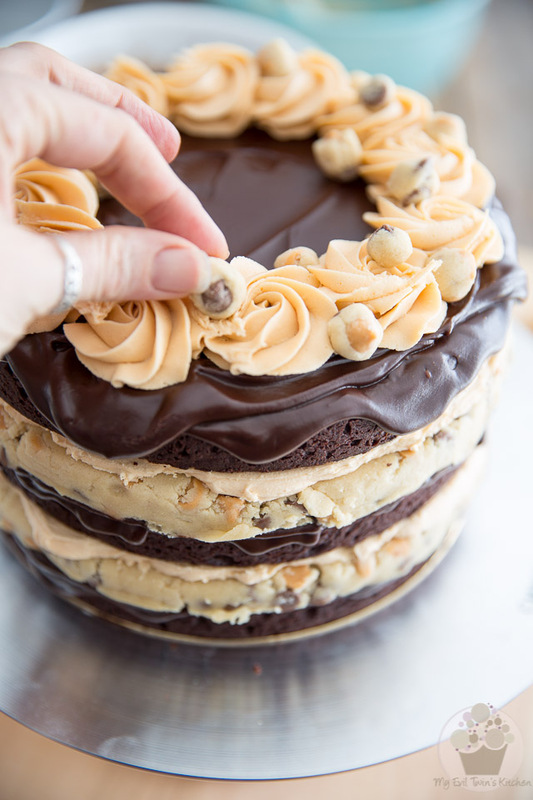 spread 1/2 cup ganache, cover with cookie dough, apply gentle pressure, spread butterscotch frosting and top with final brownie, then apply gentle pressure once more. Fill a pastry bag bag equipped with a 2D Drop Flower Decorating Tip with butterscotch frosting and pipe 12 generous swirls around the top of the cake. 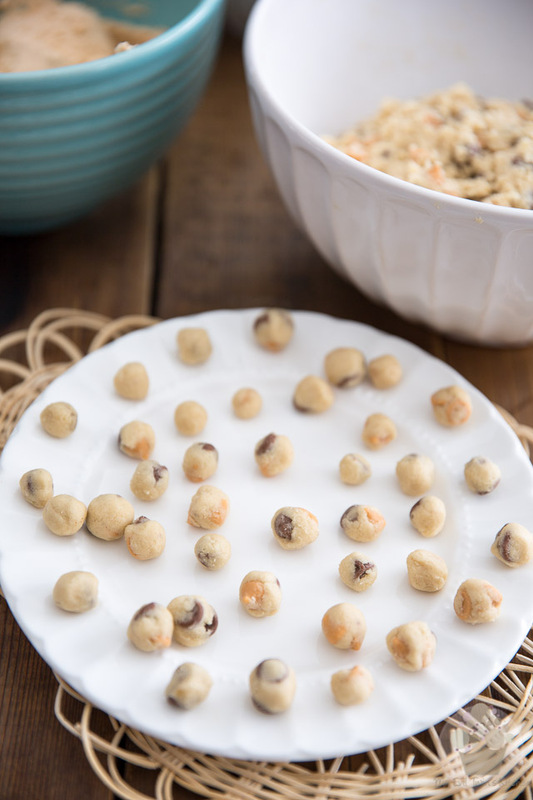 Decorate with the little beads of cookie dough you made earlier. Looks incredibly tasty! 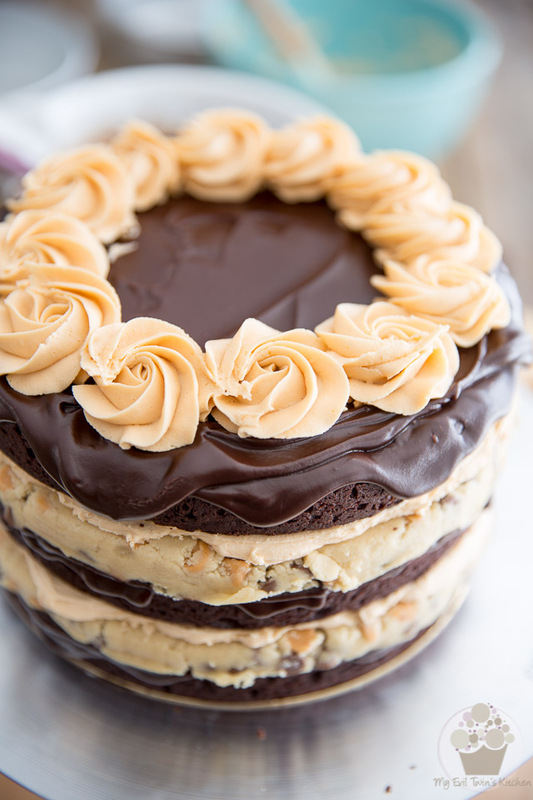 Need to make this some time soon, my birthday is next month so that’s a great excuse for it, haha! Thanks in advance and my compliments on your gorgous creation!